The 'Open Up' project comes to an end with the launch of a new café, bar and restaurant, free daytime events, and a brand new Linbury Theatre. 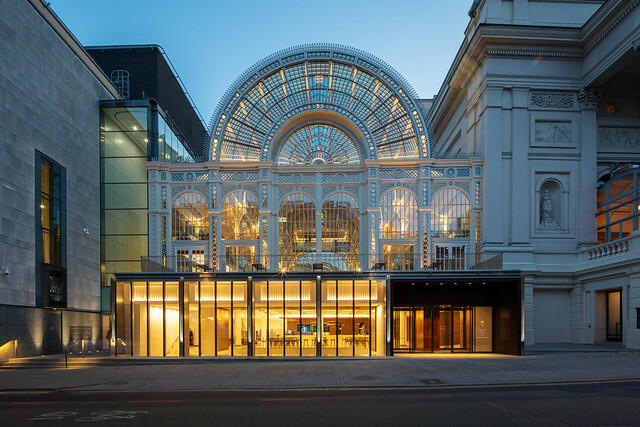 The Royal Opera House has opened the doors to its transformed new home, following an extensive three-year construction project. 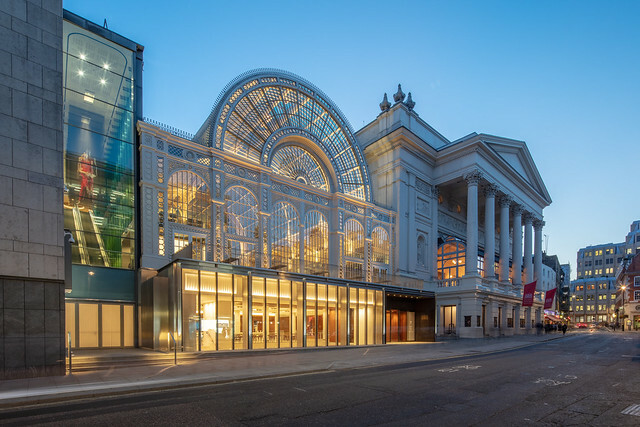 With inviting new entrances, extended foyers and terraces, and a new café, bar and restaurant; together with an extensive programme of ticketed and free daytime events, activities and festivals for people of all ages, the Royal Opera House is now – for the first time – open to the public every day from 10am. At the heart of this project is a brand new Linbury Theatre, the West End’s newest and most intimate theatre, which provides an additional world-class stage for The Royal Ballet, The Royal Opera and a host of internationally celebrated artists and partners. In its inaugural Season, the Linbury Theatre showcases an astonishing range of work, from an 18th-century rarity to 21st-century world premieres – with 25% of seats priced at £25 or less. The final construction cost is estimated at £50.7m, with all of the funds raised from philanthropy. The elegant, newly-created spaces will be brought alive with a year-round daytime programme of events, activities and festivals for audiences of all ages: events will range from workshops demonstrating the magic of backstage theatre crafts to guest artist performances and immersive events. The new front-of-house displays will include stunning costumes charting some famous episodes in the history of The Royal Ballet and The Royal Opera. and snacks as in the past? Wonderful, making it more and more accessible. I am going to check out the new look ROH on Friday! Having read the description of what’s on offer under the new daytime opening arrangements and the Eat and Drink section of the web site I am left rather confused. In addition to the new cafe, you mention that a new bar and restaurant are now available. I take it that the “new” bar on level 5 (now open from 11am) is an improved version of the old Amphitheatre bar. But where is the new restaurant and where will visitors be able to have lunch and dinner (as mentioned in the Eat and Drink section of the web site)?All the usual dining facilities still seem to be open to ticket holders only. Will the bar on level 5 (and any of the others?) be open to both visitors and ticket holders in the evenings prior to performances and during intervals? If so, how will access to the auditorium be managed? Clarification would be welcome. Thanks. The photos look fabulous with good media coverage and I'm very much looking forward to visiting next time I'm in London. Congratulations on delivering the project on time and many thanks to the donors for funding the project. I do hope the changes being made to the website will soon complement Open Up as there seem to be a few glitches. I'm sure finding the way around Open Up and making purchases in the Shop are easier than navigating the new website and buying on line. Yes please sort out the new online shopping pages and defunct links. This is a seriously retrograde move compared to the previous incarnation, where you could refine a search for a recording easily from a main list of what the ROH has on offer. All sorts of glitches - try a search for "Nunez", for example, and you now only get 4 results. Hello, I have just tried doing a ticket search for Linbury Theatre, Any price up to 31/12/2018 and nothing comes up. I suppose I am doing it correctly as if it's changed to Main Stage, there are lots of results. I think Ticket Search only brings up performances for which tickets are already on sale. There are performances in the Linbury Theatre in the Winter booking period. Friends booking opens tomorrow and Public Booking on Monday for these Linbury performances. You will, however, have to go through the list of events in the Winter booking period to find these Linbury performances. I think there has been an attempt to colour code Linbury performances but not sure it’s wholly consistent. Had to stop going to the Linbury years ago due to lack of legroom. Any improvements ? what about disabled access ? I am equally confused about the bars and meals on offer, I am afraid. I rather love the idea of the little dots program and I am thinking of offering it to my grand daughter and her parents as a form of Christmas present but the only place I can find where they can something to eat is the cafe and the menu is not really intended for anything but a coffee and a small snack. So, where can I offer them a meal or even better afternoon tea after say 1.30 pm not on a performance day? It cannot be Hamleyn Hall as the workshops take place there. Any help, will be greatly appreciated. Hi I am very excited about the new space especially the new Linbury theatre. I see that there will be a production of Handel’s Berenice on in April, as a friend can I book tickets as part of the spring package or does it have to be done as a separate booking? Otherwise still very excited about the new space. So looking forward to seeing the changes and experiencing the new spaces that have been created by this project. What about the venue policies? Will there be the same security measures as those applied to theatregoers attending performances in the auditorium (e.g. bag search on entry or whilst on your premises, large bags prohibited, etc.)? It is good that there is now a varied programme of daytime activities during the week. However I am disappointed to see that bookings are taken for the Monday recitals with no indication of either the artists or works to be performed. With a charge now being made for these events one would expect to know more information before booking. There are currently 6 recitals on sale at a cost of £12 for which there is no information. I attended the first recital which was not an exciting launch to the new regime. The singers performed well but the undiluted selection of songs by Parry was uninspiring to say the least. I don't think I was the only person feeling this way as, having been to many of these recitals in the past, this was the first time that there was no attempt by the audience to demand an encore! Incidentally the new seats were very uncomfortable! I won't get chance to see Open Up until a couple of weeks but like what I see from photos and the booklet received in the post and the new design for the front page of the website looks good (although there are clearly some teething problems). I do though have a concern about 'News' on the website and whether the Royal Opera House has decided to issue news via Facebook and Twitter rather than its website. News of the the recent Insight broadcasts on Mayerling and The Unknown Soldier were only on Facebook/Twitter. Similarly details of the programme for World Ballet day are (to date) only on Facebook/Twitter. If your 'News' website page is not going to carry such information, I think this is a retrograde step. Your news pages are an invaluable resource, excellent content, easy to access, and opportunities for people to comment. If you look at What's on and the Mayerling page there are links to recent news items and clicking 'view more' gives 20 or so fascinating news items. I would hope that the recent Mayerling Insight would be added and that it would certainly be available when Mayerling has its next revival. I do hope you are able to give some assurances that your News pages will be updated for recent events and will be used for giving timely news bulletins as happened in the past. Thanks for your interest in our content, including our livestreamed Insights. As you've noticed, we're in the process of refreshing our website, and are updating its various sections over the coming weeks and months. We'll still be sharing information and updates via our News section, but the bulk of our content offer will move to our hugely popular social media channels including Facebook, Instagram and YouTube. We're also shifting our focus towards more filmed behind the scenes content, which I'm sure will be of interest, so will be ramping up the amount of Facebook Live films and rehearsal clips, as well as artist features. In doing this, we'll be able to reach millions more each week with the magic of opera and ballet. The Open Up project has been a great success in most aspects. However there still seem to be issues. Great that the main cloakroom has been moved, thus avoiding the problems moving to the link from the main auditorium. However I attended a performance of La Bayadere where there was a ticket/programme collection point at the bottom of the grand staircase to the Paul Hamlyn Hall. It was very difficult to get to the staircase. I think the new Linbury theatre is a wonderfully intimate space, but could someone please explain what row M in the stalls is all about. No apparent access and no headroom. I attended my first performance at the new Linbury the other day (Berenice, excellent). I couldn't help reflecting, though, that the whole Open Up project is a baffling conceit. We do not need another coffee shop in London; certainly, the core function of the ROH is not to supply coffee. It does not make anything important any more "accessible" to open up the group floor for the purchase of hot drinks. If you really wish to "open up" the opera house you might put £50 million to the following uses: firstly, subsidising ticket prices (in the main hall, not just the Linbury) so that more seats are affordable for ordinary punters (compare prices at the Deutsche Oper Berlin, let alone Frankfurt or Copenhagen or Stockholm), and secondly, ensuring that more tickets are held back for ordinary public sale. I have been a Friend in the past but am not at present; I was on the website as soon tickets went on sale for the spring season, and reached the top of the queue within minutes; Berenice, Phaedra and most dates for Forza were already sold out. I was lucky enough eventually to secure returns for all three, but really, "opening up" ought to mean making it easier and cheaper to go to the opera.